It is the 30th anniversary of the annual event held to celebrate the freedom to read. The American Library Association's Banned Books Week starts today and their site provides a history of the celebration, information about banned or challenged books, and a calendar of events throughout the week. An interesting addition to Banned Book Week is the Virtual Read Out Page. The following comes from the page and explains how you or your local library could participate. "For the second year in a row, readers from across the country and around the world will be able to participate virtually in the 30th anniversary celebration of Banned Books Week, Sept. 30 – Oct.6. 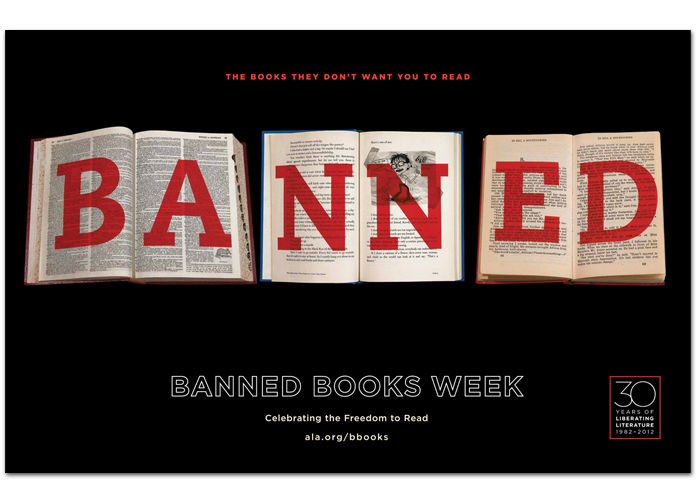 Participants may proclaim the importance of the freedom to read by posting videos that will be featured on a dedicated Banned Books Week Virtual Read-Out YouTube channel. Instructions on how libraries can participate in the event can be found on the How your library can participate in the Banned Books Week Virtual Read-out! page. If your organization will host a Banned Books Virtual Read-Out, consider using this free promotional poster. Videos (no more than two minutes long) can be submitted by anyone as long as it includes a reading of a banned or challenged book. The video must include information on where and why the book was banned or challenged. You may also wish to add your thoughts on the importance of keeping that particular book on library or bookstore shelves. Videos of up to three minutes long can be submitted giving eyewitness accounts of local challenges. For those who are camera shy, you can still participate in the Banned Books Virtual Read-out by creating a video montage that centers on banned/challenged books. Thomas University created a video last year that can be used as an example. Submit your video by filling out this form. You must have a YouTube/Gmail account in order to upload to YouTube." So spread the word and happy reading! Thanks for reminding me that it's banned book week and all the info/links!